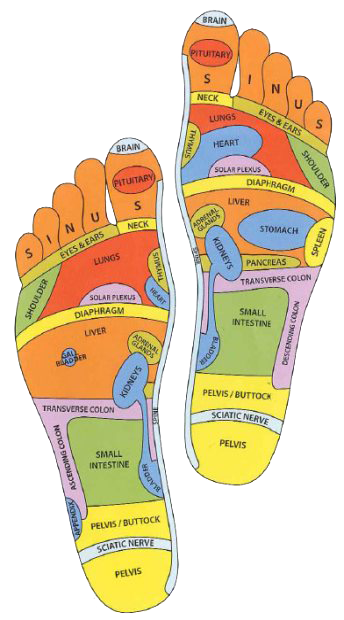 Reflexology is therapy based on the principle that all organs, glands and bodily systems are reflected on the foot and hands. Beyond the feel-good effects of the treatment, the practice and purpose go deeper than the skin and muscles. During the treatment are applied various forms of thumb pressure and palpation techniques on the foot to induce a healing response in corresponding organs and areas of the body. 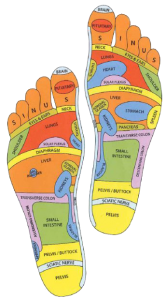 Reflexology can be used for restoring and maintaining the body´s natural harmony. Also cleanses the body of toxins, boosts the immune system, increases circulation, balances energy and brings peace in mind. Is suitable for people of all ages – from babies to the elderly. The treatment starts with 5 minutes foot bath and lasts approximately 40 minutes. During the reflexology session the client is clothed lying down on massage table and bio vegetable oils and natural essential oils are used. Important is wait at least one hour for massage after eating, don´t receive reflexology if you are pregnant, drink enough water after the treatment and consult a doctor if you have foot problems, an injury, a blood vessel disease associated with clots or varicose veins.